"3LA1, V-2344" by Timothy K. Perttula and Robert Z. Selden Jr. CONTEXT INFORMATION: From a grave in a cemetery excavated by Horace McLendon in the fall of 1941. Associated vessels (from several graves dug at that time) include V-2342 to V-2365. DECORATION: The vessel body has a circular engraved motif that is repeated four times. The motif consists of alternating circular engraved lines (three lines) or circular dashed lines (two lines), and each motif shares part of one of the circular dashed lines. Suspended from the top of the bottle body are four repeating triangular elements with hatched lines in each corner of the triangle; these elements are set above the area where the larger circular motifs merge and help to divide the circular engraved motifs. Belcher Engraved, var. 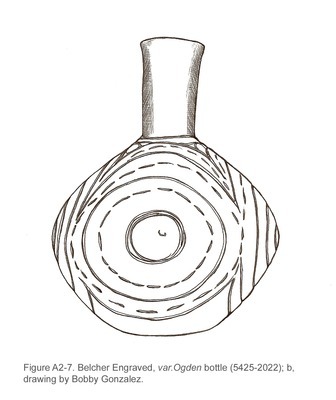 Ogden bottle (5425-2022): a, photograph; b, drawing by Bobby Gonzalez.